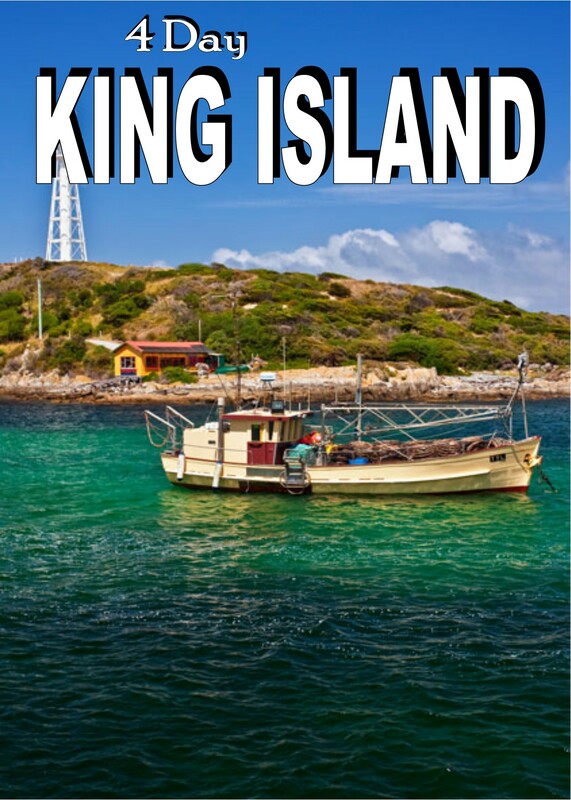 Discover King Island on our four day adventure and explore an island rich in history, with shipwrecks, lighthouses and jagged reefs, bountiful with long stretching sandy beaches and lush green pasture. Travel to Tullamarine Aiprort to board your morning flight to King Island. On arrival you will be given a friendly King Island welciome by our tour guide and taken to Boomerang by Sea, our accommodation for the next 3 nights. During dinner at our hotel enjoy the sunset across the water. King Island produce is sought after around the world by man top restaurants and this morning , we visit a local farm to learn about some of the island's agriculture. In the afternoon , explore the island's main township of Currie. Visit King Island Historical Society Museum which is housed in the old lighthouse keeper's residence. Discover the island history where there is a emphasis on material from shipwrecks. From the museum we can see the nearby Currie Lighthouse, a wrought iron structure which was prefabricated in England and sent to King Island in 312 pieces to be assembled in 1879. Return to our accommodation top enjoy the sunset across the water during dinner. Today, we visit Seal rocks State Reserve at the southern tip of the island, home to a calcified forest. Follow the walking track to the viewing platform overlooking the 7,000 year old remains of an ancient forest revealed when the lime laden sand, which had covered and preserved its stumps, trunks and branches, was blown away. Next stop is Grassy, once a thriving mining town but since the closure of the town's mine, Grassy has reinvented itself as a vibrant village with the small community of locals expanding to include creatives and holiday makers. Grassy is a popular deep water fishing harbour and is home to the island's main port. Travel to the east coast past City of Melbourne Bay to Naracoopa and admire the white sandy beaches of Sea Elephant Bay. After dinner we venture out to view the fairy penguins at dusk as they parade to their nests. Look out for the local wildlife on our return to Currie. As we travel north today, watch out for wild turkeys crossing the road, peacocks, geese and ring-necked pheasants feeding in roadside paddocks. View the Yellow Rock River and the Panoramas of Christmas and New Year Islands from Yellow Rock Beach. Visit Penny's Lagoon, a suspended lake (one of only three in the world). Continue to beautiful Martha Lavinia Beach where the miles of pale sand are a drawcard for surfers, fishermen and shell collectors. Standing proudly at the northern most tip of the island, Cape Wickham Lighthouse, built in 1861 using local granite, is the tallest lighthouse in the Southern hemisphere. Reflect on the heartbreak of shipwrecks as you view the grave stones of the crew of the "Neva" and "Loch Leven" and gaze out across the Bass Strait at the distant wreck sites. Returning South we visit the world renowned King Island Dairy for opportunity to taste the speciality cheese in the Fromagerie and purchase from range of delicious prize winning dairy products. Finish our tour of King Island in the late afternoon, then head to the airport for our flight back to Melbourne. We hope you travel home with fond memories of this quiet, peaceful paradise.